Confession: despite my job, sitting down and playing a game is often incredibly difficult for me thanks to depression. How depression disables me from enjoying things doesn't always present itself in the same way. Sometimes, the way I think about a game's objective ruins it, even though there's nothing wrong with the game per se—I might, for example, look at Skyrim as a giant to-do list. Sometimes my depression rebels against the idea of moving forward and making progress, and games aren't really something you can passively play. You've got to make decisions, you've got make plans, you've got to take action. Progress: kind of the antithesis to depression, no? And sometimes my depression makes it seem a game asks too much of me, requires me to be creative in a way other media don't. The only reason depression isn't as debilitating in real life for me is because I know I need to get it together enough to make money, to eat, and vaguely take care of myself. But in order to ensure survival, I have to find motivation. Often that motivation seems to come less from me than it does expectations of what a normal, healthy life is supposed to look like. It's a form of pretending, in a way. You're supposed to go out. You're supposed to socialize. You're supposed to exercise. There are a number of things I do that might make it difficult for someone to know there's something 'wrong' with me, but depression still tints everything I do. That includes games—and it also means that it's difficult for me to look at the games I play outside of the context of depression. The games I attach myself to the most give me something in spite of my depression. I often cite Gears of War as one of my favorite games because its mechanics are so evocative, so palpable, it's difficult to play the game and not feel something. In a world where many things feel dull (did you know that diminishment of color vision accompanies depression? ), that's something I welcome. I don't quite remember what happiness feels like, but I do know what the crush of a headshot in an intense competition feels like. Maybe that sounds sad, but, listen—I'm going to take what I can get. It wasn't always like this, of course. Sometimes I go back to a game I know I used to love and it seems alien to me, an artifact of a time that seems too distant to have happened this lifetime. And if it did—well, whoever that happened to...that was a different person, no? Funnily enough, it's exactly what I'm going through now while playing it even though there was a time when I did find enjoyment in doing all those things. Now it seems more pointless, in a way. But if I gave up every time a game didn't make me feel anything, well, I'm not sure I'd play very many games. As I mentioned before, part of coping is finding something—anything—to motivate me. Stuff that allows me to go through the motions, if you will—even if I don't feel much while doing it. At the start, most of what the game presented me wasn't of interest. Why should I want to pay off my mortgage? Why should I want to collect stuff like fossils? Animal Crossing presents this very romantic idea of domesticity—of wanting that big house, the white picket fence in some quiet, sleepy town—that I'm not sure I identify with. The lifestyle you pick up because, well, that's just what you do, you know? What to latch onto here? If some of my motivation doesn't come from me, exactly, in real life—then maybe that could be true in the game too? Though nobody can visit my town yet (outside of press), the way I started thinking about the game was in the context of other people. Impressing other people is a goal, much like any other. How can my house wow other people—how should I decorate, how should I landscape? What sort of items would other people consider cool? What sort of neat designs can I come up with to share? How do I dress to command awe? I'm not far enough into the game to enact plans for these questions yet—I don't have enough money, and I haven't seen enough of what it has to offer to know—but I'm still actively thinking about it as I go along. It's causing me to interact with most of the game and see what it has to offer. My town, although untouched by visitors at the moment, has been entirely molded by them in a way. It might seem insincere, and it's definitely a form of pretending that's all about meeting the expectations of other people, but thinking about Animal Crossing like this has helped me move forward with it. Impressing other people is a goal, much like any other. Regardless of the reason, and regardless of how useless the exercise might seem at times, as I play now, I'll still occasionally notice things. My secretary calling herself a "good puppy." The way the townsfolk light up when they notice me sometimes—they have something important to tell me (a new nickname, probably). Ah, my mom sent me something in the mail again—how'd she fit a bed into the mailbox? Or the faint hope that the pesky creature, the one that bobs my bait a handful of times before biting down—maybe whatever lurks in the water is a rare fish this time. 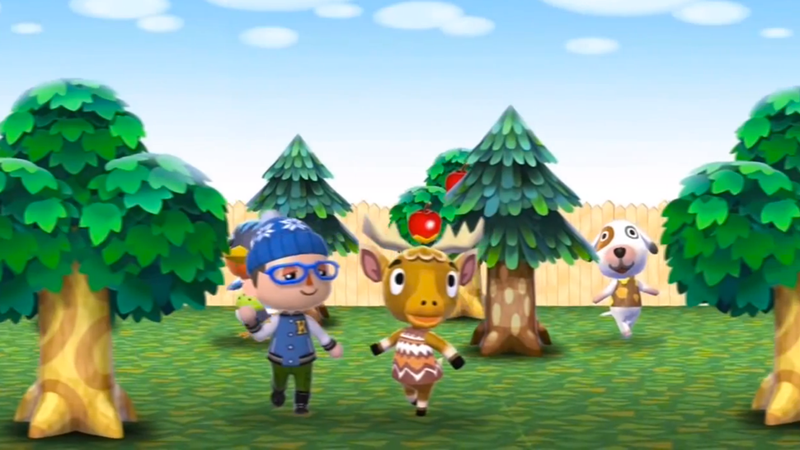 Sometimes I might shift back to looking at Animal Crossing as detachedly as I did Skyrim—a large to-do list—but the external motivation of impressing other Animal Crossing players keeps me going for long enough that I can see stuff like that. The charming stuff, I mean. The stuff I might miss if I gave up altogether—the stuff I know is in there but that I can't immediately recognize as pleasant anymore. To compare with something from real life for a second—I took up painting recently. I'm not the artistic type, it just seemed like something that I could do for myself. Something healthy, as decided by more well-adjusted people than I. Admittedly I don't know what I'm doing. The initial empty canvas, watching myself try to construct a picture from an aimless void—trying to construct a visible whole of something...that was grueling. It seemed useless—what I came up with wasn't very good—but I forced myself to keep going anyway. I kind of hated the entire ordeal, but some parts of the picture—the way the color soaked in, the way a line looks—captivates me, briefly. The simplest things can defy you when you're depressed—getting out of bed, remembering to eat, remembering how to have fun. Hell, even a brushstroke can resist you. Despite that, I think I'm looking forward to the next canvas, if not the next experience in Animal Crossing. It's like—faintly, faintly, somewhere, whatever tangled itself up wrong remembers how to rewire itself for a second. Somewhere the spark sputters again. The thing about carrying on pretending—in real life, in games, whatever it is—is that eventually, hopefully, it's not pretend anymore.